A closer look - different processing. The 4 stars of the Trapezium are more easily seen here. I have always found it hard to process this target because of the High Dynamic Range.....the very bright center burns out the rest of the image if one does not use very short exposures to blend in with the long. 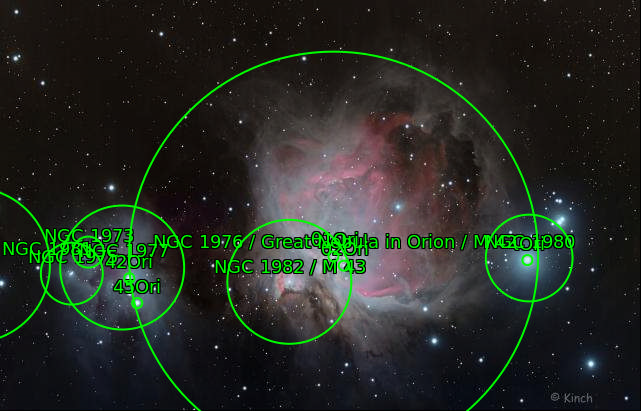 The Running Man Nebula is the smaller one on the left. (Tilt your head left and view the left of the image as being the top). 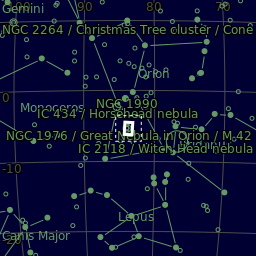 The nebula is sometimes visible with the naked eye even from areas affected by some light pollution. 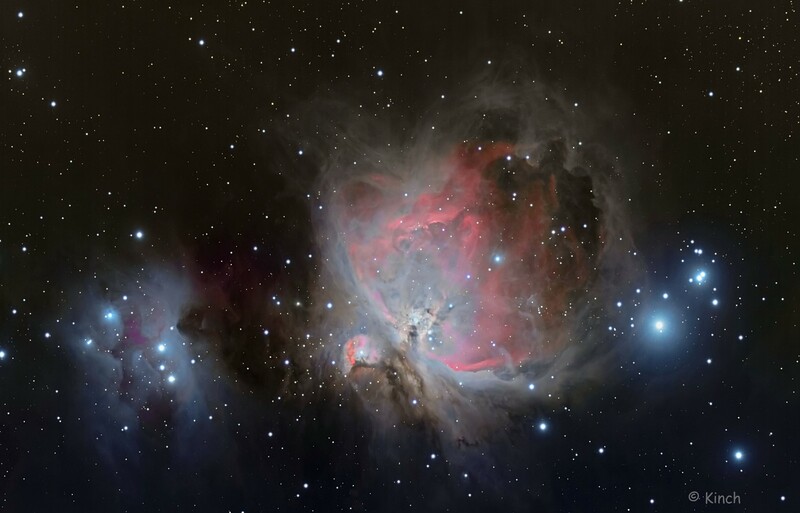 It is seen as the middle "star" in the "sword" of Orion, which are the three stars located south of Orion's Belt. The star appears fuzzy to sharp-eyed observers, and the nebulosity is obvious through binoculars or a small telescope. The Orion Nebula contains a very young open cluster, known as the Trapezium due to the asterism of its primary four stars. Two of these can be resolved into their component binary systems on nights with good seeing, giving a total of six stars. 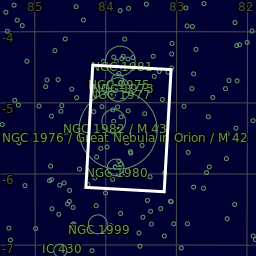 The stars of the Trapezium, along with many other stars, are still in their early years. 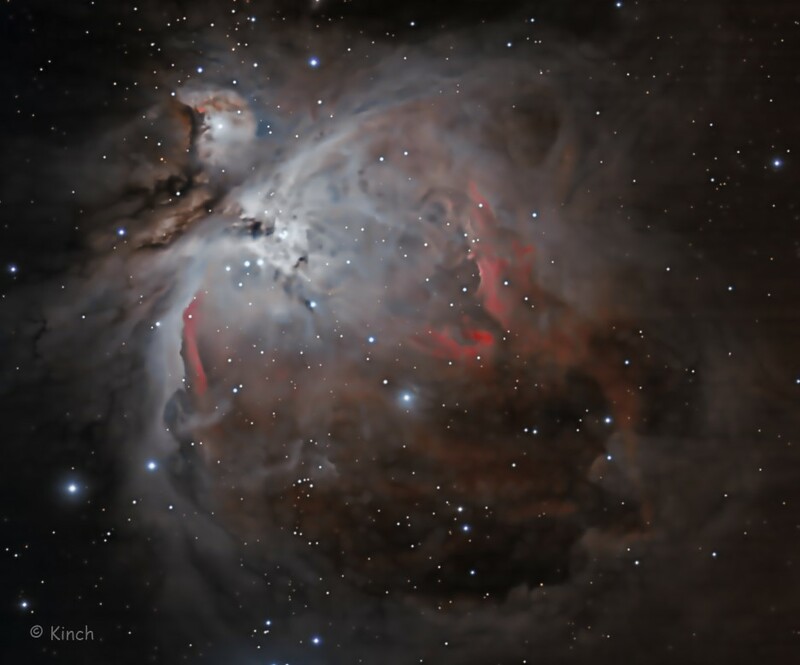 The Trapezium is a component of the much larger Orion Nebula Cluster, an association of about 2,800 stars within a diameter of 20 light years.Two million years ago this cluster may have been the home of the runaway stars AE Aurigae, 53 Arietis, and Mu Columbae, which are currently moving away from the nebula at velocities greater than 100 km/s. Astronomik Ha 6nm: 8 x 300" + 2 x 600"
Astronomik Lum: 60 x 60" + 90 x 30" + 120 x 10"
Astronomik RGB: 180 x 20"
Integration: 3 Hours 47 Min. Center (Dec, dms):-05° 21' 40.957"